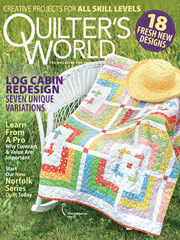 Looking for a different type of quilting pattern? Download this free design to stitch a quilt that combines stretched versions of the Bow Tie and the Four-Patch blocks in stunning black, white and red. Size: 64" x 64". Block Size: 8" x 8", 8" x 16", 16" x 16".